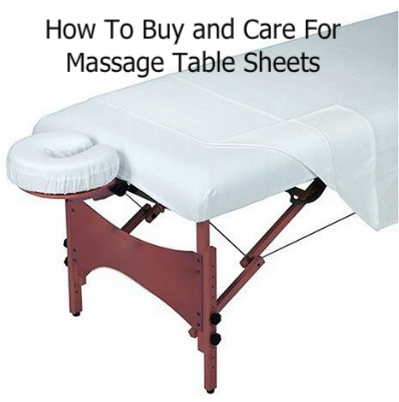 Massage table sheets protect the massage table from oils and provide a sanitary surface for the client. Most massage therapists want sheets that are easy to care for and comfortable for the client. You can also choose sheets to create atmosphere; for example, sterile-looking white sheets for medical massage or plush flannel sheets for a spa. Buying massage sheets can be as simple as going to the local department or discount store and buying a standard twin-size sheet set. A twin fitted sheet fits a standard-size massage table, plus you get a flat sheet for draping and a pillowcase to cover the face rest. You can also buy specially made massage table sheet sets. The advantages of 100% cotton sheets are that they feel soft (especially cotton flannel) and release oil more easily than cotton-poly blends. Their disadvantage is they tend to wrinkle easily. Cotton-poly blends generally wrinkle less and tend to be more durable. Other, less common, fabric options to consider are bamboo and hemp. Another option, though not environmentally friendly, is disposable massage sheets. When you buy sheets, always wash them before use to remove any unwanted residue from the fabric. To more easily remove oils, wash sheets within 24 hours of use. If you can’t wash within 24 hours, store the sheets in a black plastic bag, tied shut, to keep out the air and light that causes oil to turn rancid. Use water-dispersible massage oils and creams to make cleaning sheets easier. Wash sheets in warm water and rinse them in cold water to both save energy and help sheets last longer. Hot water and a hot dryer will set in oil stains and create smelly sheets. Bleaching is not necessary, unless you work in a hospital or similar environment. Warm water and detergent kills most common germs and bacteria. Bleach does not remove oil stains, shortens the life of fabric, and is harmful to the environment. Presoak heavily soiled massage linens before washing. You can use commercially available degreasers, stain removers, borax, or baking soda. In consideration of clients with sensitivities, use unscented detergent free of chemical additives. Also, avoid fabric softener, which can cause allergic reactions. Instead, add 1/4 cup of vinegar to the final rinse to eliminate odors, reduce lint, brighten colors, and remove residual detergent. If you have sheets with newly set-in oil stains, wash them using automatic dishwasher detergent (not liquid dish soap, which will cause too many suds). Dishwasher detergent is slightly abrasive and made to dissolve grease. This technique works only for newly set stains and also greatly reduces the usable life of sheets. Tip: If you don’t want to deal with buying and washing massage table sheets, you can use a linen service that supplies the sheets and launders them. However, usually the only type of sheets available are a white cotton/poly blend.